I am always on the lookout for quick and new ways to teeth whitening. I have always opted out from professional whitening services and rather whiten my teeth at home. I have tried the whitening strips and the whitening toothpastes in the past and received the expected results. However the whitening strips have provided pain to my sensitive teeth and the whitening toothpastes seem to take longer than expected. I need a powerful whitening gel that is quick but does not irritate the nerves in my teeth. Also who doesn't want instant results when whitening their teeth! 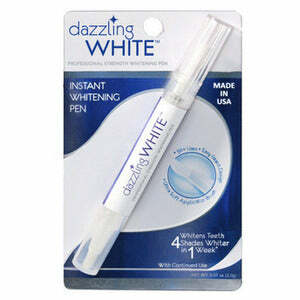 The Dr. Fresh Dazzling White Professional Strength Whitening Pen works really well! I haven't whitened my teeth in a while and I used the easy whitening pen at night and by the next morning, my teeth were slightly whiter. I continued to use the Dr. Fresh Dazzling Whitening Pen a few more nights in a row and my teeth were a at least 2 shades whiter. The whitening pen is really easy to use as well. A simple few clicks and the gel forms within the bristles. You simply paint your teeth with the whitening pen. With the whitening pen, I could easily reach the hard to reach areas that whitening strips could not reach. I can focus on certain teeth that are more stained than others. I experienced no sensitivity and there was no harsh taste that the whitening strips have. I can easily whiten my teeth on the go and I do not necessarily have to rinse out my mouth. I can carry this whitening pen with me at work or in my car for a quick touch up. This whitening pen is perfect for traveling when you want to keep your teeth white but do not want to travel with the bleaching trays or the whitening strips. This is probably the most convenient way to whiten my teeth easily. I highly recommend using this product for when you are on the go. Rating: 5 stars out of 5 Dazzling White Whitening Pen is the quick and easy way to give yourself an amazing white smile without the hassle! Instead of having to spend hundreds of dollars at the dentist, or putting on uncomfortable trays or strips on your teeth for hours at a time, with Dazzling White all you have to do is paint it on, its as simple as that. Painting is actually the most effective method to whiten your teeth because it allows the gel to begin the whitening process the very moment it gets on your teeth. The professional strength hydrogen peroxide removes the stains deep within the tooth so you get a whiter smile every time you use the Dazzling White pen. Not only is it incredibly effective, its also the most convenient whitener on the market! It’s a pen that can go with you everywhere, and it doesn’t interrupt your day like trays and strips do. No uncomfortable things on your teeth, no worries! And within one week, your teeth will be up to 4 shades whiter!